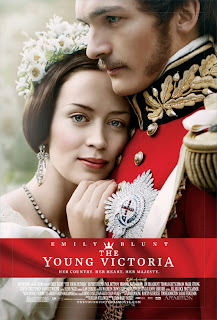 The Young Victoria, starring Emily Blunt and Rupert Friend has hit the US and is now out in theaters! ".....a film that chronicles Queen Victoria's ascension to the throne, focusing on the early turbulent years of her reign and her legendary romance and marriage to Prince Albert. Directed by Jean-Marc Vallée, written by Academy Award Winner Julian Fellowes (Gosford Park), and produced by a team including Graham King (The Departed), Martin Scorsese, Tim Headington and Sarah Ferguson, Duchess of York - the film has already received international acclaim"
Hi Amy, hope you had a great Christmas! I'm looking forward to go see this movie, and hopefully it will be sometime this week. I'm fortunate that it is being shown at a theater that is only a couple of blocks from my work-place. I so hope I can get to the theatres to see this one!! I'm not a big Victoria fan but I always love seeing movies based on history like this! Haven't read much about Victoria but I really loved this movie! Unfortunately, I couldn't see in a theatre but only on a DVD. It hasn't been and probably won't be released in Italy. I loved this movie, anyhow. I love anything Victorian so I couldn't miss it! Thanks for the beautiful clips. I really want to see that! I know I won't get to in the theater, so I am going to put it in my Netflix queue right now! This movie is to be released on DVD in Australia on 31/12/09 and I've pre-ordered my copy. I loved the film when I saw it at the movies and can't wait to watch it again! Thanks for this heads-up on this. I can't wait to see it. Oooo it looks so good. Hey you..thanks by the way for the little note in the mail. Sure made my day. Happy New Year! I absolutely loved this. It portrays Victoria as such a strong and dynamic woman. Two thumbs up from me. How refreshing to see a woman of strength in an historical film! I saw this back in September at the Vancouver International Film Festival. It was quite good. My only quibble was that I would have liked to learn more about her. I guess that's what books are for. LOL! loved, loved, loved, this movie!